I've finally got some information on the Sports Stadium and this can be found on the Go-Karts page but there was also an outside Roller Rink. I have no information on this at all, apart from the fact that an elderly relative remembers going skating up there in the '50s, and in 1962 Edwin Green was hoping to cover it and turn it into an International Centre. This never materialised, we suspect due to the Council refusing planning permission. He had bought all the fittings from the Cresta Ballroom in Luton which was being demolished and was intending to use them in his new centre, some of these ended up in the Devil's Den. Kevin Plunkett who was a pot boy, amongst other things, in 1967 says that there was Sunday night Bingo. 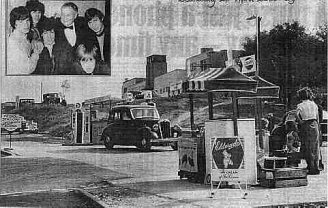 I do however have a photograph from the Dunstable Gazette of the Petrol Station taken in 1955 before the ballroom was built. By 1962 this was a National Benzol retailer and it opened at 7am.